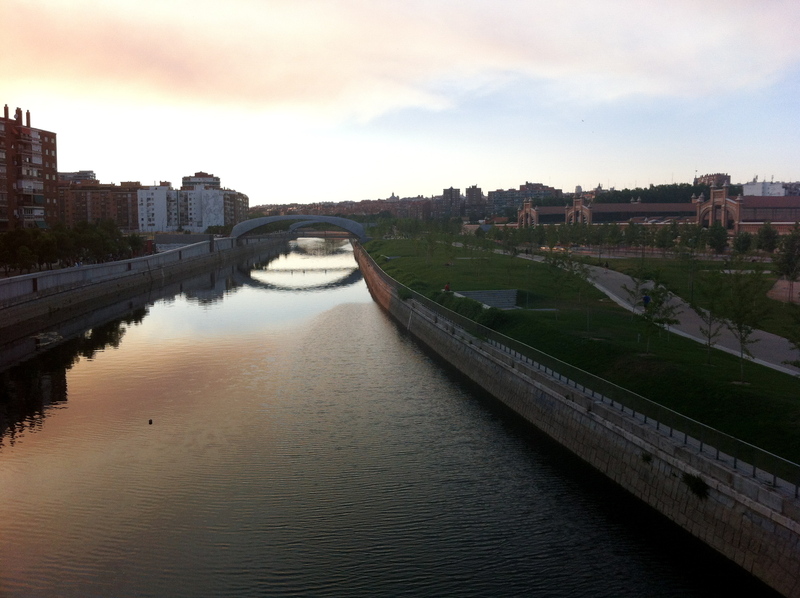 That would be the Río Manzanares, aka a canal through the heart of Madrid with the most consistently flat water I’ve ever had the pleasure to row on. I got to row Monday, Tuesday, and Wednesday – getting in about 34k total. I wish I had had more time to spend on the water, but alas such is the struggle of studying abroad. So much to do, so little time. But I have officially decided I am going to have to live in Spain for some period of time in the future, whether it’s another study abroad or a year or more of working. So, Remo Madrid – until next time. Side note: the public transportation in Madrid was sooo convenient. The rowing club was all the way across the city, but using the metro I got there in 30 minutes (20 minutes metro, 10 walking to and from the metro stops). It’s pretty cool to be able to go to a metro stop and wait 2 or 3 minutes.. instead of the 15 or more with our very own MARTA. Not to mention that I never felt unsafe at any point while traversing the city – no matter the time of day. Maybe it has to do with the fact that the Spanish don’t have a concept of “night=sleeping” like us, so there are always people out and about. Even at 5:30am.. but we’ll get to that haha. I just love that city. Love love love. Thursday we had our final exam, which was very fair given the material we covered and the studying we’d done. After that we had an hour-long flamenco lesson! I was a little hesitant at first, but it was such a neat experience and I definitely developed a taste for that kind of music. I actually have become more of a fan of Chambao – or “flamenco chill” as it’s called. It was a little awkward at first, but after a few minutes we all just went all out and looked silly together. The greatest was seeing all the guys get so into the moves. What we lacked in talent, we sure made up for in passion, or at least effort haha. After flamenco I headed to the train station to buy tickets for the weekend in Morocco, then headed back to the residence for dinner and packing for Barcelona! After our 4th of July celebrations last weekend, I learned the hard way that it’s best to pack before going out. Since it was our last night in Madrid (the weekend was spent in Barcelona, and then Monday morning we had to leave for Granada) we all went out into the city as a group. The night started at around 11 at El Tigre – a tapas bar a few blocks away. For every drink you ordered, you got a huge tray of tapas.. with 10+ people we ended up with more food than you could imagine. After finishing our (quite generous) drinks and as many tapas as we could eat, some people called it a night and others headed to Teatro Kapital – one of the most famous night clubs in Madrid with 8 different, themed, stories. I was in the latter group, and we even got in free thanks to some coupons with free cover before 1:30am. That was definitely a great example of Madrid nightlife: at 1:30am the place was almost completely deserted. Things turned around though, and it was a pretty awesome night. Sparing the details, we ended up walking back to the residence around 4:30am.. getting back just in time to shower and walk allllll the way BACK across the city to catch our train to Barcelona. After some much needed sleep during the 2 or 3 hour train ride, we made it to our hostel in Barcelona and chilled while our rooms were readied. 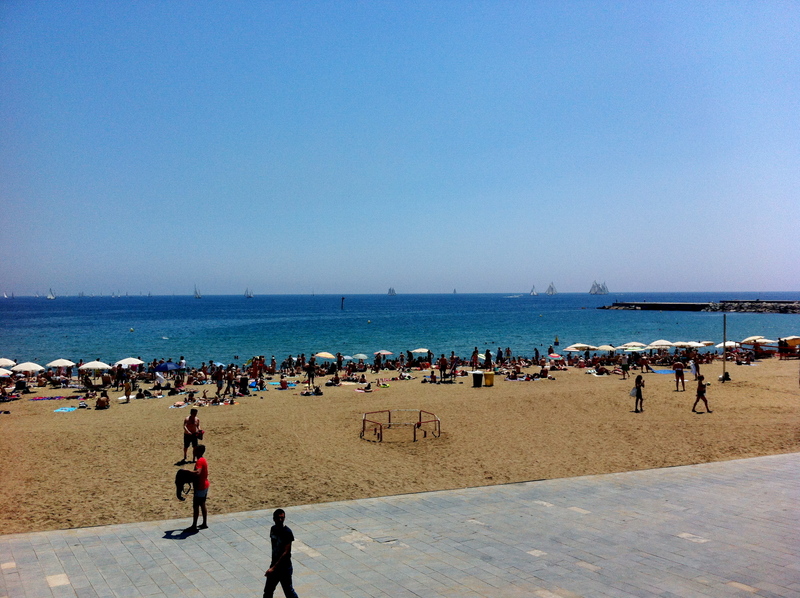 After checking in and changing into bathing suits, we headed the main Barcelona beach around 1 or 2pm. I missed the beach so much and it was a perfect day to be out there. It was packed, but the hot weather and cool dips into the Mediterranean made it so worth it. During our few hours on the beach we enjoyed the sun, talked to a lot of club promoters (talk about an ego boost), and even partook in a particular Spanish beach tradition. It was a good day to say the least. It took us a while to figure out which bus to take back to the hostel, but once we got there and showered we were back out for dinner and some night life. It wasn’t a crazy night for me, but a fun one nonetheless. The hour (plus) walk to get there was sooo worth it. Being at the top of the city, there was a cool breeze blowing and I decided it was a great time for a nap. So on a bench in the shade, amidst other tourists checking out the view, I had a nice little 30ish minute nap. It definitely broke into my top 5 naps ever, so that was bueno. I spent the next couple hours wandering the park, stopping to listen to other musicians (they were everywhere, and were all really good), and appreciating the various famous parts and monuments within the park. 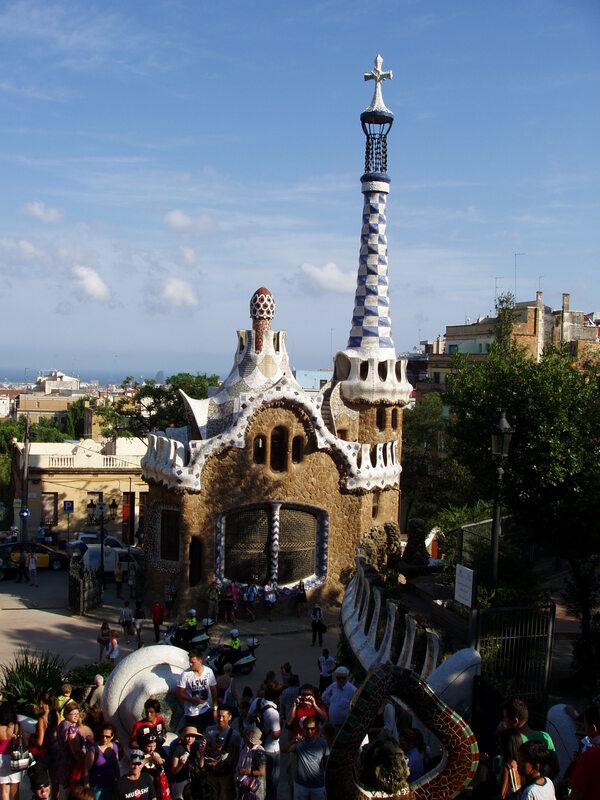 Gaudí – the dude responsible for the Sagrada Familia and this park – definitely had some crazy going on. But the good kind of crazy, evidenced by the thousands of people enjoying his creations across Barcelona. The rest of the that day was very chill – I took the bus back to our hostel (again, very simple – Spain public transportation continuing their record of excellence) and relaxed for the rest of the night. A couple of us ordered pizza from a recommended local place and took it easy. The next day we slept in again (our rationale was that you enjoy the city more if you’re rested.. makes sense right?) and then headed to the Parc de Montjuic – it was only a few blocks from our hostel and I’d read it had some pretty great views of the city. Barcelona definitely corners the market on beautiful mountainside parks. 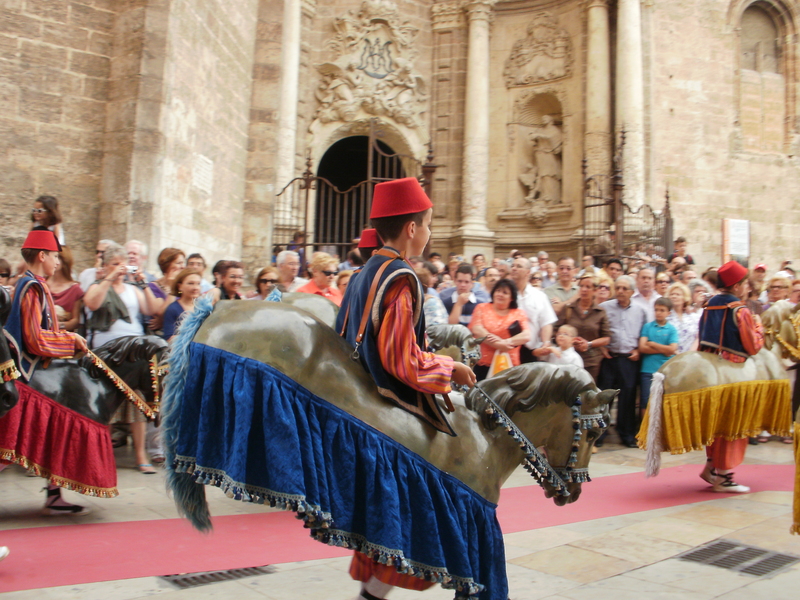 However, on the way, we encountered a tiny parade with “gigantes” – giant puppet-esque people we actually had just finished learning about in our culture class in Madrid. The park was very nice – we climbed up to a nice shady spot with stairs and all chilled out with some music and conversation.. and maybe a little napping. We had to continue the tradition of spending the last day of each weekend excursion lounging in a local park, after all. And the view of Barcelona and its port, of course, was incredible. ALRIGHT getting closer to the present day! Power through, I’m getting there. So, we arrived back in Madrid late that night, and woke up early the next day to make the bus leaving for 7:30am to Granada. I have to admit I was really sad to leave Madrid, and would have been content to spend the next 2.5 weeks there. 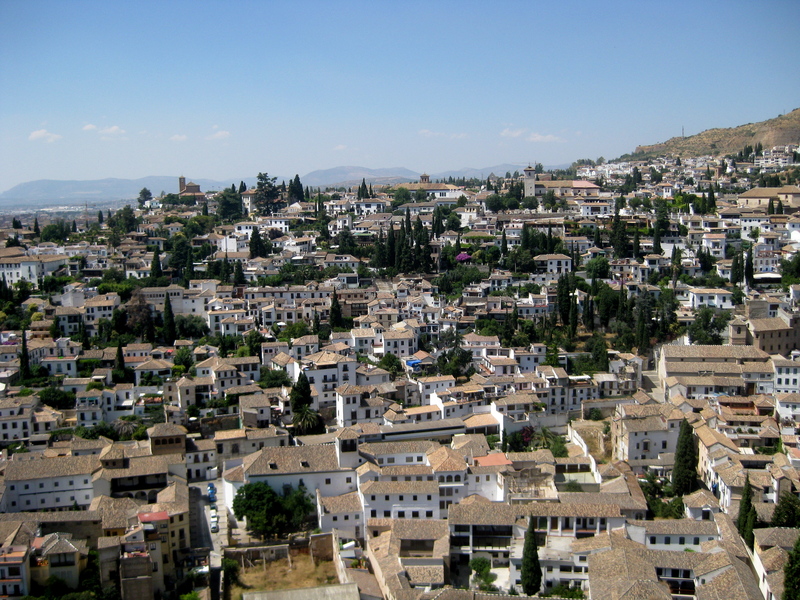 Although, now having been in Granada for not even 2 full days, I am more than happy to be here. Anyways, our bus was pretty classy and we each got a pair of seats to ourselves – aka there was some serious nappage getting done over the 5 hour ride down to Granada. We arrived around 1pm and met our host moms – mine is AWESOME. She’s so nice and is more than happy to converse with me despite my still a little broken Spanish. We had our first meal of ham/cheese spaghetti, salad, and watermelon for desert. There’s also another student living here with us – Anna from Australia (originally Hong Kong but she’s studying down under for her “uni” as they call it). She’s learning Spanish from scratch, so it’s such a cool mix of cultures and language skills under one roof. One roof which happens to be an adorable little apartment – tasteful and spacious and airy and generally cute. Libby and I definitely lucked out with our host home. After lunch with our host mom and Anna we headed to the Centro de Lenguas Modernas for our first afternoon of classes. Turns out “classes” included “massive city-wide scavenger hunt”. I can undoubtedly say that it was the most fun scavenger hunt I’ve ever been on. We explored almost the entire city, which helped me to decide that Granada is the the most beautiful city I’ve ever been to. Yeah, I know there’s lots of “most ___” and “best___ of my life”s in this post – but what can I say.. Spain is just incredible! 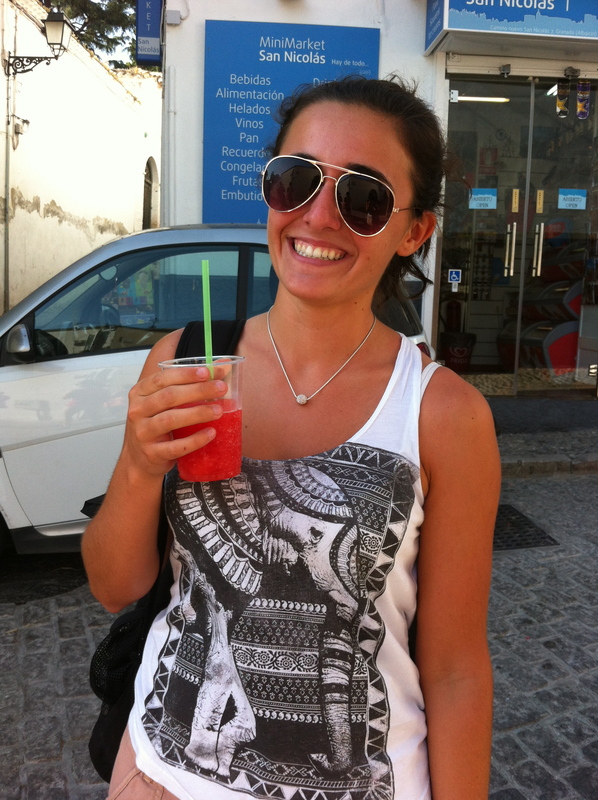 And during said scavenger hunt, we stopped for some tasty smoothies… dare I say the tastiest smoothie of my life? After the scavenger hunt (which really only consisted of visiting various parts of the city and taking pictures there.. like you even need to ask a group of 5 college girls to remember to take pictures.. pshh) we had a scheduled dinner of drinks and tapas at a local tapas bar. I can’t even express how much of a fan I am of drinks and tapas being a scheduled, and paid for (thanks program fees!) event during my study abroad program. 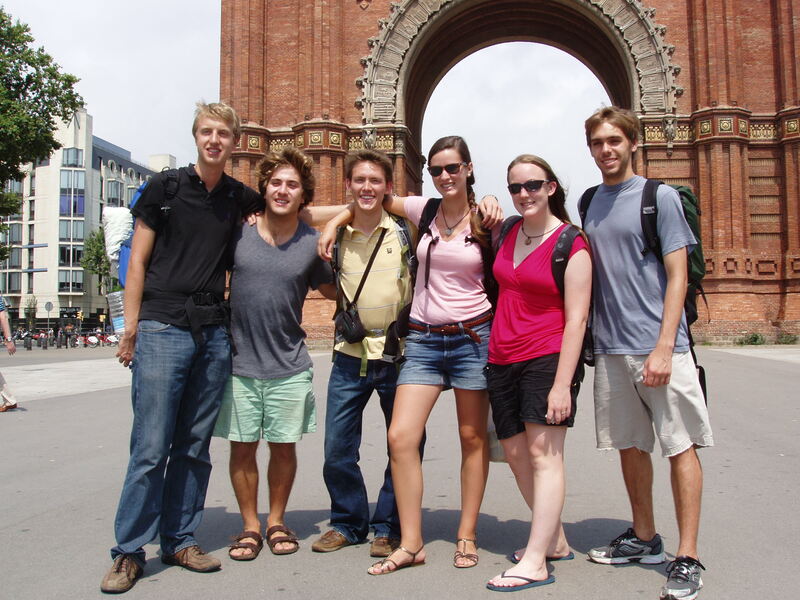 Notice to all students: Spain LBAT is the way to go!!! Yeah. Exactly. Gorgeous is probably the word you’re looking for. It was also incredibly hot, but that’s a smile price to pay for seeing one of the most visited sites in the world. After touring the whole area, which was chock full of beautiful and intricate architecture, carvings, and wall and ceiling designs (not to mention gardens), we headed back into town to get some homework done (we had to interview people about their thoughts regarding the current economic crisis in Spain) and then back home for dinner. After which Libby and I had an hour long discussion with our host mom regarding the current economic situation in Spain, complete with arguments regarding the causes and effects of the situation. Just had a casual intelligent conversation completely in Spanish – the usual. Oh how I love studying abroad. 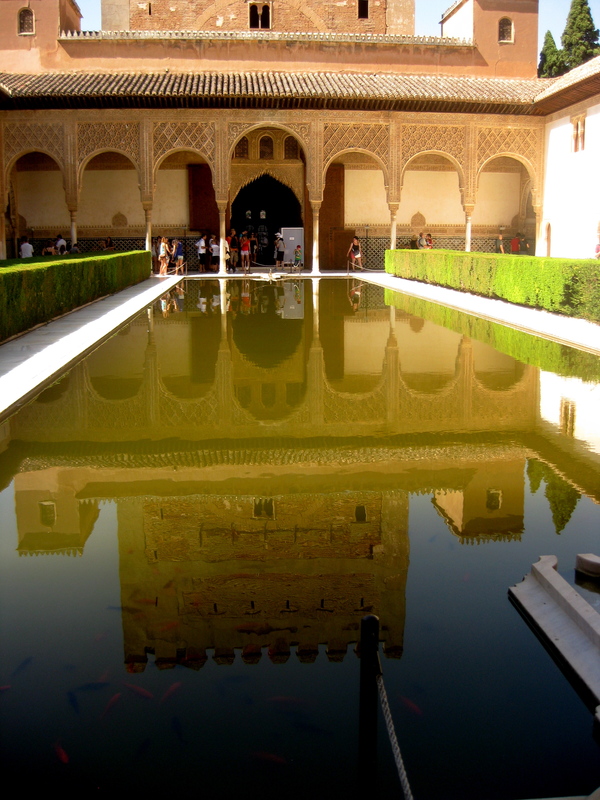 We’re now up to date, so I’ll leave you with one picture of Alhambra! Two weeks have never flew by this fast! So much has happened since I arrived that it will be hard to pack into one post, but I’ll do my best to give the highlights. Stepping out from the plane after a nine and a half hour flight was certainly disorienting. As I walked past the airport security agents, I noticed something incredibly odd. They were speaking a different language to each other. For some reason, it had never really sunk in that this would happen. I think half of me expected for there to be an English translation of what they were saying over the loud speaker. Still, I moved along to customs where I started to break out the Spanish. I delivered “Hola!” and “Gracias!” with the charm of an American tourist. The agents rolled their eyes, and I continued on my journey. A short bus ride later, and I was at my dorm. One of the things that struck me immediately about Barcelona was all of the graffiti and art lining the streets. I had always pictured every city in Spain to be picturesque and quaint. The art gave the city a much more urban feel, and I liked it. 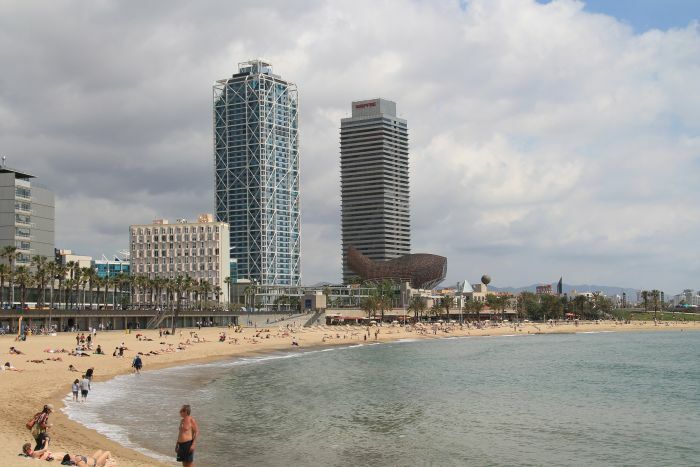 After a long night, we woke up the next morning to explore more of Barcelona. We headed down to the beach during the day, witnessed a spontaneous parade over lunch, and hiked up to Monjuic in the afternoon. For reference, Monjuic is a old military base overlooking the town. 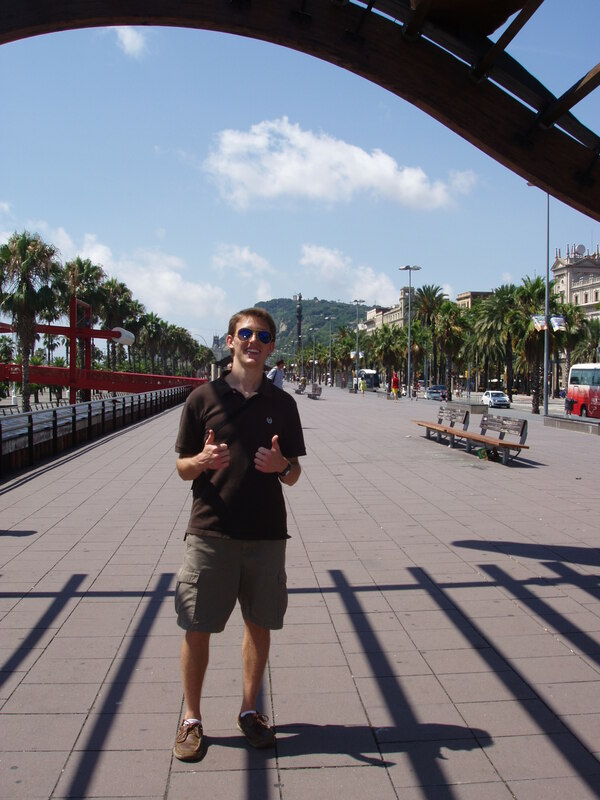 It was great to get a sense of Barcelona so early. I never would have been able to grasp the layout otherwise. Monjuic also provided an interesting mix of old and new. The base was built in the 1600s, and includes cannons that are now covered in graffiti. I thought that I would be opposed, but it actually provides a very interesting contrast. On the way down, we passed through parks and other landmarks while being informed by the group’s leader Sabir Kahn. He was incredibly knowledgeable about Barcelona and filled us in on a lot of Catalonia history. Soon, it was time to go to class. Unfortunately, the campus we are commuting to is 40 minutes away by Metro :(. Still, it is nice to see college life outside of the states. For most of the week, I was able to explore Barcelona during the night. Sometimes, I would wander to a new part of town to see if I could discover anything new. Because the program is split between CS and Architecture majors, the programmers are getting much more exposure to architecture. One place I traveled to was the German Pavilion, which is extremely prevalent in Architecture. I went with a couple architects, and they explained to me why the building was so important. Their excitement was very interesting. 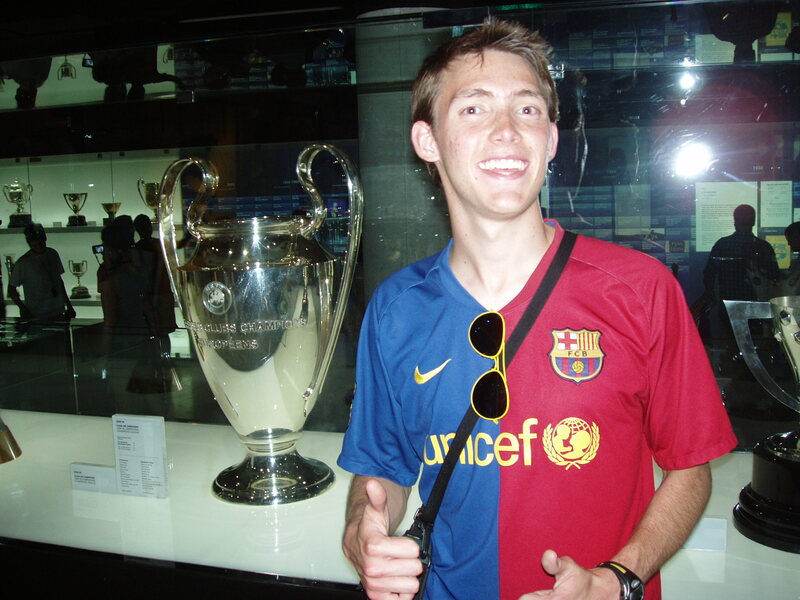 However, the weekend soon rolled around, and I had the opportunity to go to two extremely exciting events: the X-games and the FC Barcelona game. While at the X-Games, we got to see Moto-X and skateboarding big air. It was a lot more exciting than what you see on TV, but the announcers spoke Catalan (different from Spanish) so it was hard to understand. Another amazing thing was the age of the competitors. The kids probably averaged 16. 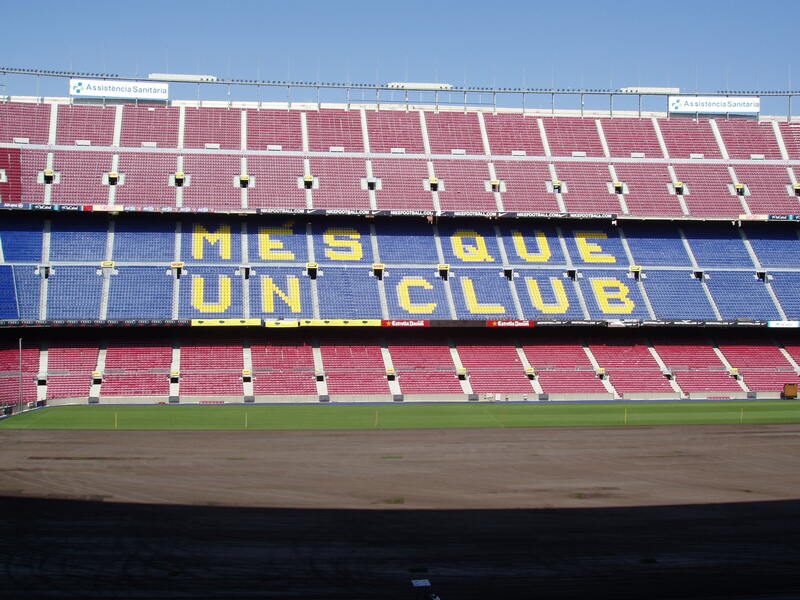 On Sunday, we traveled to Camp Nou for the Barcelona game. We fought freezing rain, but there was still a surprising amount of people out. One thing about Barcelona sports: people watch the game. Unlike America, when I went to go to the bathroom, there was almost no one in the halls. I was even the only person in the bathroom (something you would never see at a football game). This weekend, Barcelona was blessed with great weather, and I went with a group of others to hike up to Tipidado, a mountain that contains the odd mixture of a cathedral and an amusement park. 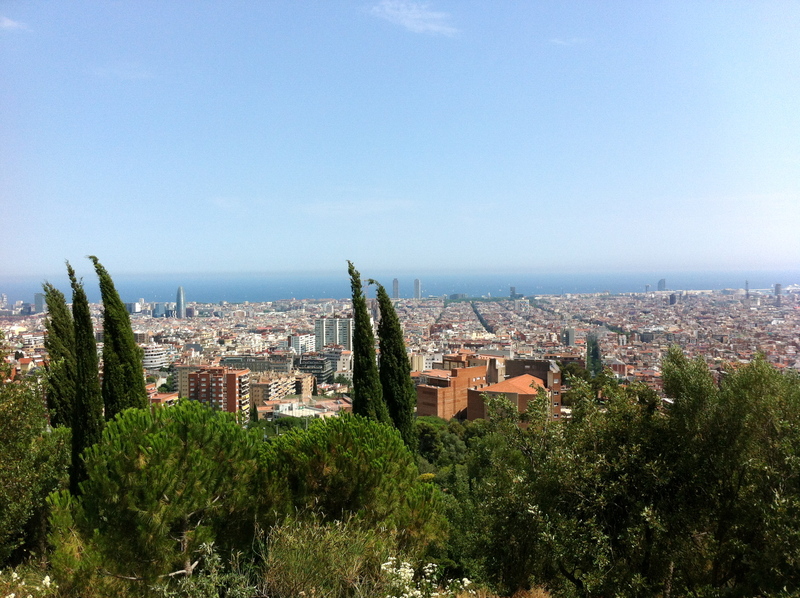 The hike was beautiful, and the top of the cathedral is the highest point in Barcelona. That night, I had the opportunity to meet up with friends from Madrid who were studying abroad as a part of the University of Kentucky program. These experiences were just the high points of the first two weeks. As the program progresses and we start to travel, many more incredible times will be had. 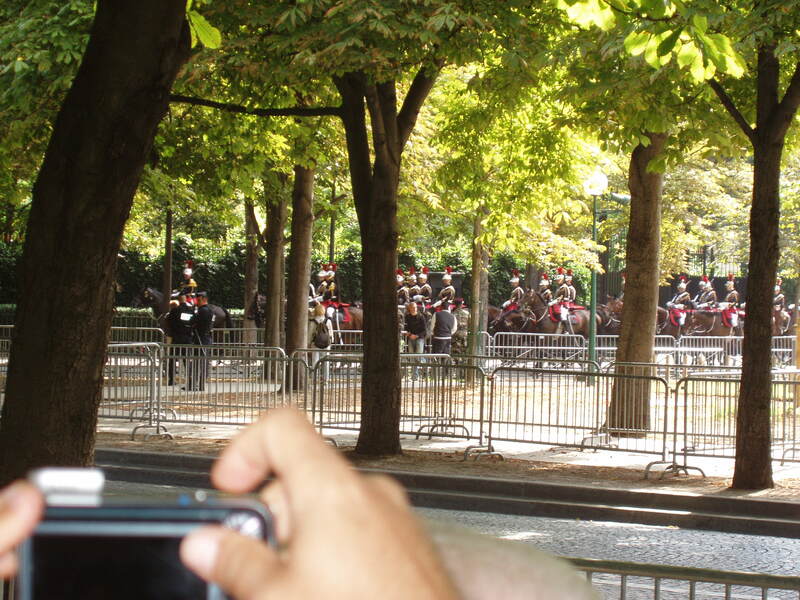 Posted by Andy Barrenechea in Travel Log. 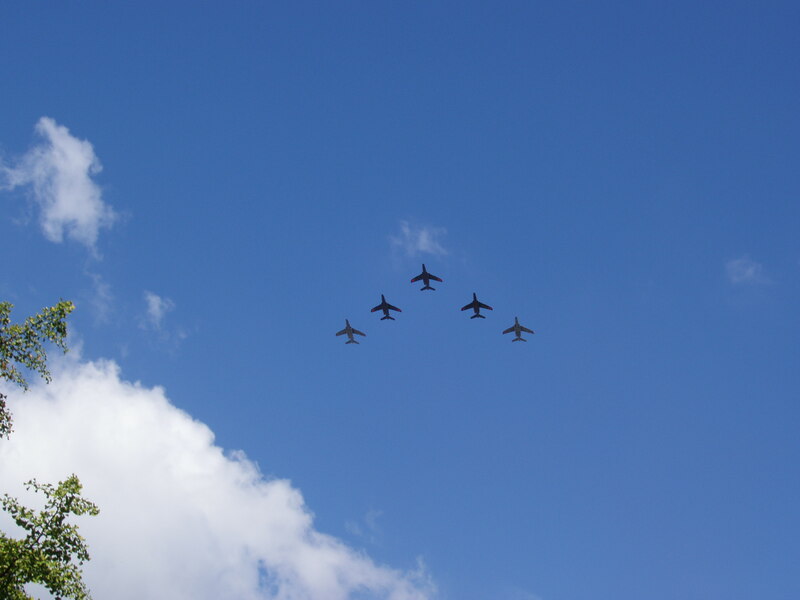 A few of the many planes that flew over us. 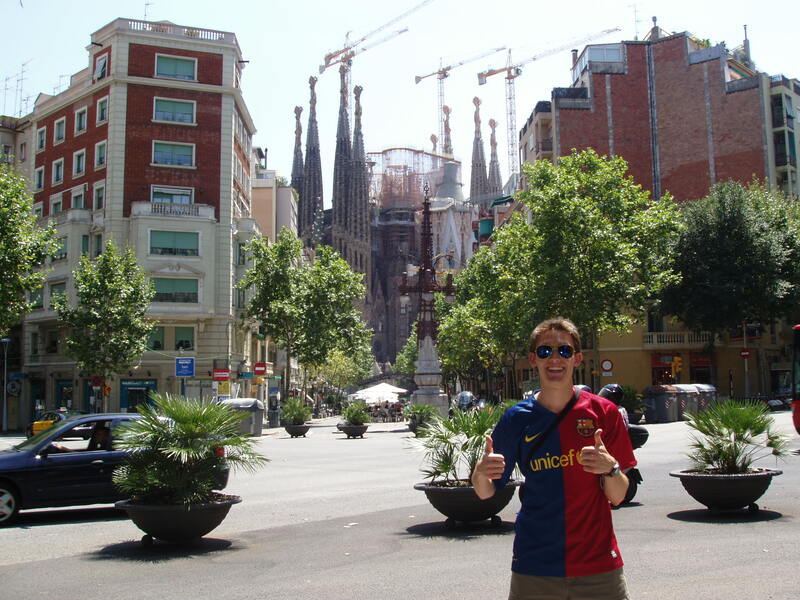 That's Sagrada Familia, still under construction after 100 years, in the background. It's known as "La Orejona". That means "More than a club". 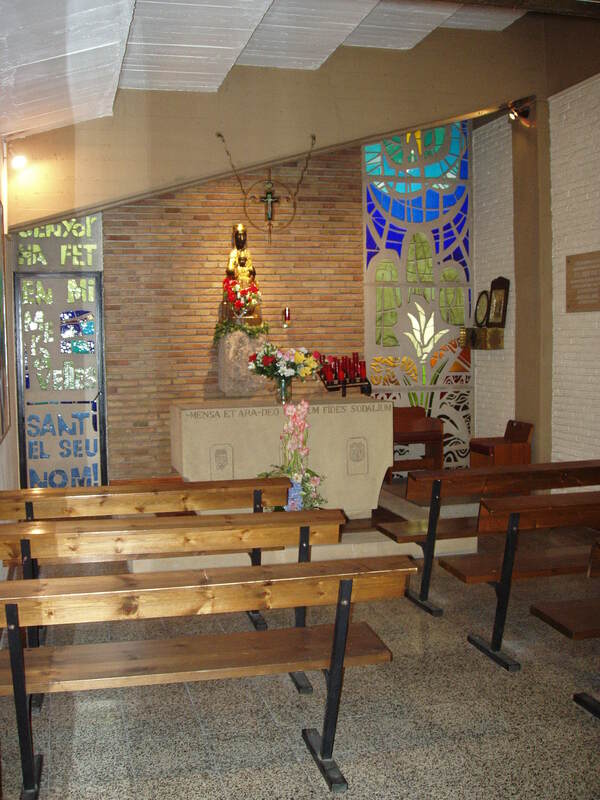 This chapel is actually located in the players' tunnel. 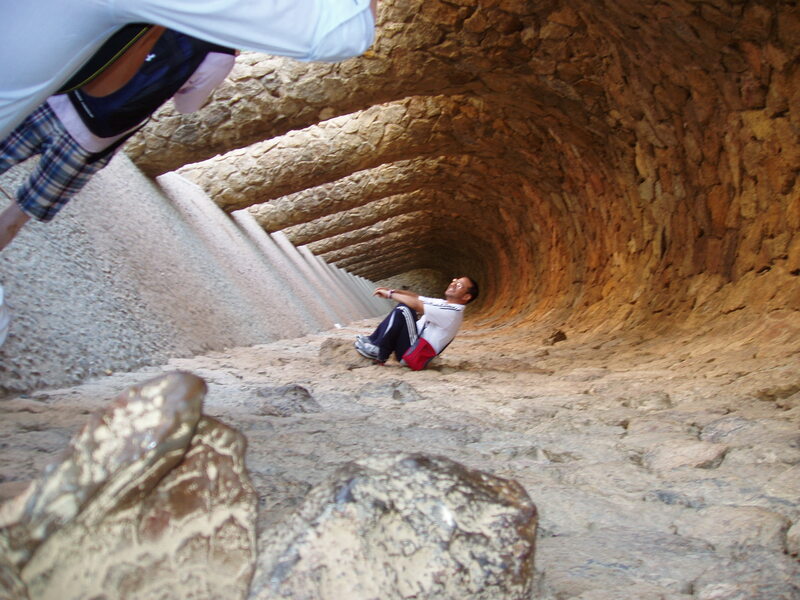 Those are Gaudi's famous arches. The group on the last day! The book that we are reading for class talks a great deal about machismo and the effects of it. 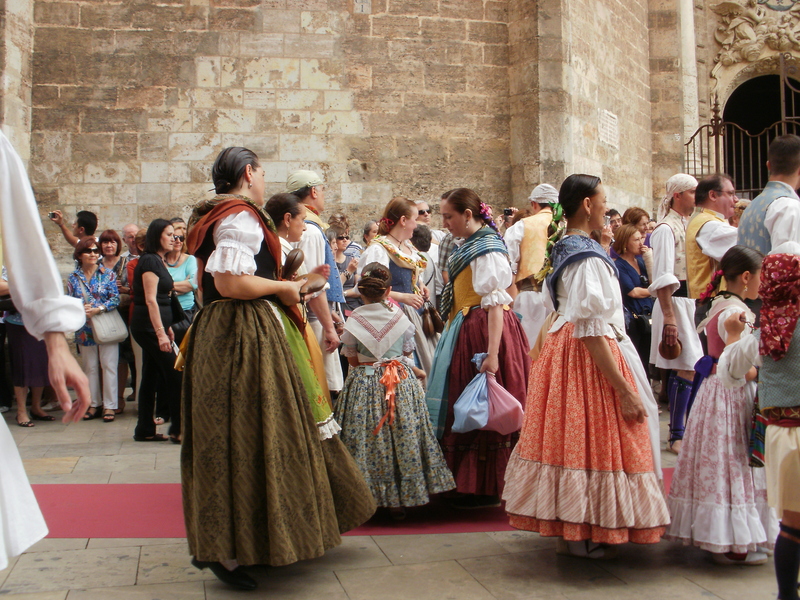 I was thinking about this when some of the girls and I were sitting in the Plaza de la Reina in Valencia waiting for the Corpus Christi parade to begin. I was looking for signs of men being very macho, but I never really noticed it. The men seemed normal to me. It started to rain at one point and some of the older men were holding umbrellas over their wives , but that was more of chivalrous act than anything else. So this got me thinking about how “machismo” the men in Spain really are. I was wondering this when I saw a women dressed in business clothes with apron on, hanging clothes outside of her apartment. This almost made me laugh because it seemed to be something out of a t.v show like Leave It to Beaver. This lady looked very Mrs. Cleaveresque. But then I realized that this woman is not just dressing up nicely to work at home. She must have come from work (this was during siesta time) donned an apron to get some housework done, and then she will probably be off to work again. 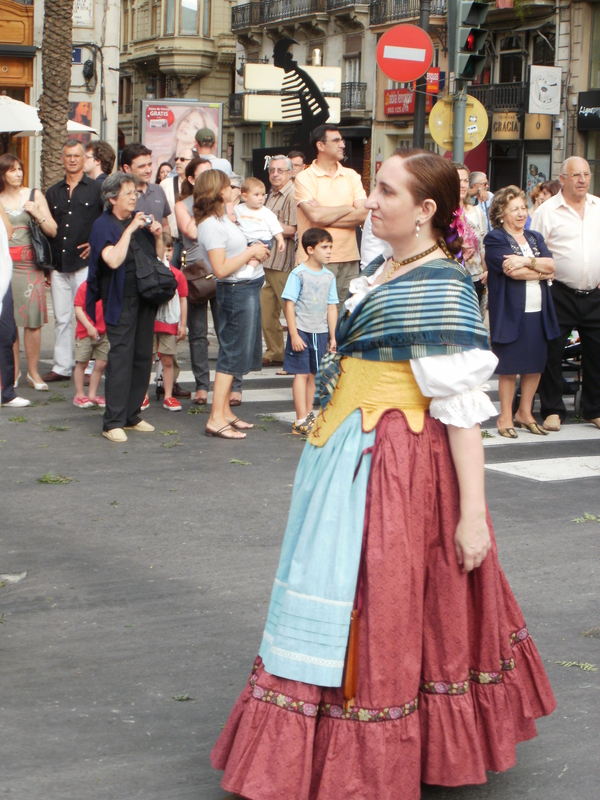 The women here in Spain seem to have taken on many roles. This is good in a way because they are able to experience all aspects of life. They choose to work and I’m sure m any of them enjoy the freedom that work entails. But then on the other hand, working during the day leaves less time to do the chores that they would usually do during the day. So how do these women cope with this? Well, it appears that they are simply doing everything. It then occurred to me that there was still “machismo” in Sapin; it’s just not as blatantly obvious as I expected. I did not see any men coming home during siesta and working around the house. Instead they are off eating(or most likely drinking) with coworkers. So, indirectly, the women are still being held back by the men. I have grown up with sports. Ever since I was little, there has never been a time when I was not playing some sort of sport. Needless to say, my dad was constantly playing sports with me and my mom was constantly taking me to all sorts of practices. However, n o matter how long I have been playing, no sport affects me as much as soccer affects the people of Spain. Sure, they are really into their soccer, you may think. It’s for them like baseball was for America at one point, the national pastime. But, no. Not quite. 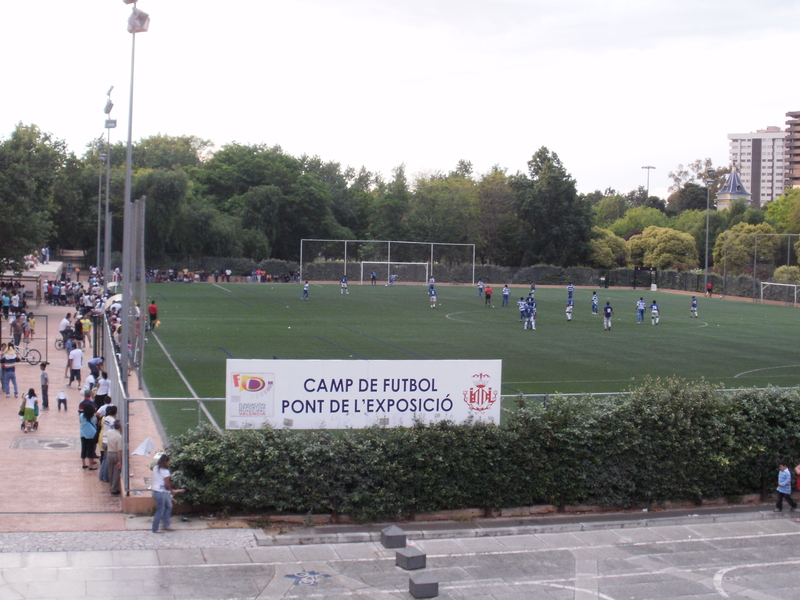 Soccer in Spain is in a whole different ballpark (excuse the pun). In Spain, soccer defines who you are. Soccer has history. No, not the history of “team x” beating “team y” so many times since the 1900’s. Rather, the history that I am referring to is the history of the people. Spain has not always been a unified nation ( and many agree that today it still is not a unified nation). And one factor that still keeps many parts of Spain separate is soccer. It divides the nation because each region has its own team and cheers whole heartedly for just that team. Ok, so you say this is just like different conferences in the United States. For example people in the ACC don’t like people in the SEC. Maybe, but not really. The reason that the different regions in Spain each has their own team is rooted more in history than in location. So what is the history of Spain? From what I have seen (and read) so far about Spanish families, it seems as if they are a very cohesive bunch. ld hands, but in comparison to the U.S. it is quite out of the ordinary for teenagers to still be holding their parents’ hands. Posted by wjewell3 in Uncategorized. For breakfast, my host family would offer Paul and me two slices of white bread, two crackers, a small cup of OJ, and a bit of tea for breakfast. It was more or less balanced, but it wasn’t much compared to the huge breakfasts I was accustomed to in Mexico (or in the States for that matter). I think the breakfasts and dinners were not as big in Spain because lunch was supposed to be the biggest meal. In the beginning of the trip, I would get hungry b/c all I was eating for lunch was a boccadillo. Midtrip, however, I discovered that eating a balanced, heavier lunch was worth the extra euro or two.